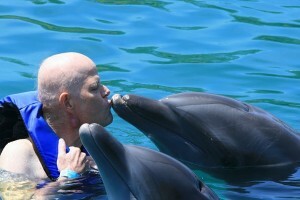 Dolphins are playful and loving, intelligent and wise. Most dolphins have acute eyesight and can hear frequencies ten times or more above the upper limit of human hearing. Dolphins establish strong social bonds; they will stay with injured or ill individuals, even helping them to breathe by bringing them to the surface if needed. Dolphins are protective—they’ve protected swimmers from sharks by swimming circles around the swimmers or charging the sharks to make them go away. Throughout history, dolphins have been known to guide lost ships home. Dolphins have been called “angels of the sea,” and in mythology are considered to be magical beings. But most of all, dolphins are raucously playful and joyful. Have you ever noticed how they always seem to be smiling? We didn’t know much about dolphins or realize we were “dolphin people” until our first Matrix Energetics seminar. Dale had used laughter therapy in his sessions with clients for years, but at the Matrix seminar his laughter literally exploded to a new level. As Dr. Bartlett stood on stage describing frequency 16, the dolphin and whale frequency that can bring abundant states of joy, laughter, and playfulness, he touched Dale who immediately fell to the floor, flopped around like a dolphin, and laughed hysterically for more than ten minutes. Within seconds, his laughter and joy rippled through the room and everybody was caught up in the energy. Is laughter really the best medicine? You bet! Numerous studies and testimonies show that laughter is incredibly healing and has even caused “spontaneous remissions” of serious illnesses. One man even said that after watching a funny movie each night for two months, his “terminal” condition had vanished! As we drove home from that first Matrix seminar in Seattle, we saw dolphins and whales everywhere—on billboards, signs, even on the side of a building by the ferry terminal. When we got home and entered our house, we realized we were surrounded by dolphins—near our fish tank hung a beaded curtain, each bead the shape of a dolphin; we had dolphin wind chimes, dolphin candles, crystal dolphins, stone dolphins, and even dolphin bookmarks. We stood in stunned silence as we realized that we’d been unconsciously collecting dolphins for years. Then, of course, we burst out laughing. Dolphins will often show up in client sessions. They join in to bring healing, laughter, love, and sometimes tears. If you have any questions about sessions, please contact me.